The basic idea of bitSplit when it came to developing iFuntastic was to create an application that made it easier to customise an iPhone, iPod touch or iPad. The first thing you have to take into account when it comes to using iFuntastic is that it offers different options depending on whether the gadget to be customized has been subject to a jailbreak process or not. 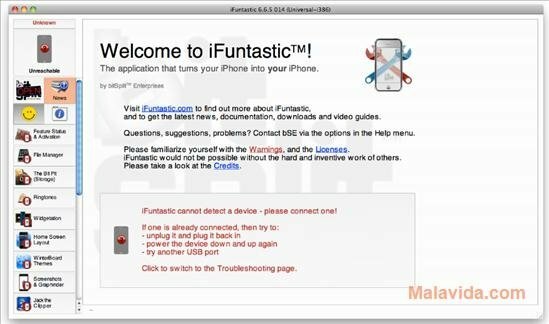 If the device is out-of-the-box, iFuntastic only allows you to customize the ringtones, to use it as a mass storage external USB drive and to copy screen captures and wallpapers. Nevertheless, if it has experienced a jailbreak process, iFuntastic allows the user to perform many more things with it, because as well as the actions mentioned earlier, it allows you to create start and block screen with widgets inserted in them, change the message of your voice mail, create your own Cydia repositories, modify the SSH passwords, etc. Therefore, if you want to modify certain elements of your iPhone, iPod touch player or iPad tablet, download iFuntastic right now.